Delta Gamma Fraternity has been suspended from campus for at least two academic years for violating the university’s hazing and alcohol policies. The allegations first came to light in February, resulting in the Dean of Students Office issuing the chapter a cease and desist on Feb. 27 and placing the organization under investigation. However, it was not the university that issued the decision to suspend the sorority but the Delta Gamma national organization. The national Delta Gamma Fraternity Council voted unanimously to suspend the chapter for at least two years because of the findings of the UM-led investigation, according to a press release issued March 27. The national office also said that the UM investigation was related to allegations of “hazing, harassment, alcohol distribution, forced alcohol consumption and delegated travel with unknown male students to locations” during Big/Little Reveal Feb. 16. The chapter pled responsible to the allegations March 21. A UM spokesperson said the university’s only comment regarding the suspension of DG’s chapter would be Whitely’s statement. 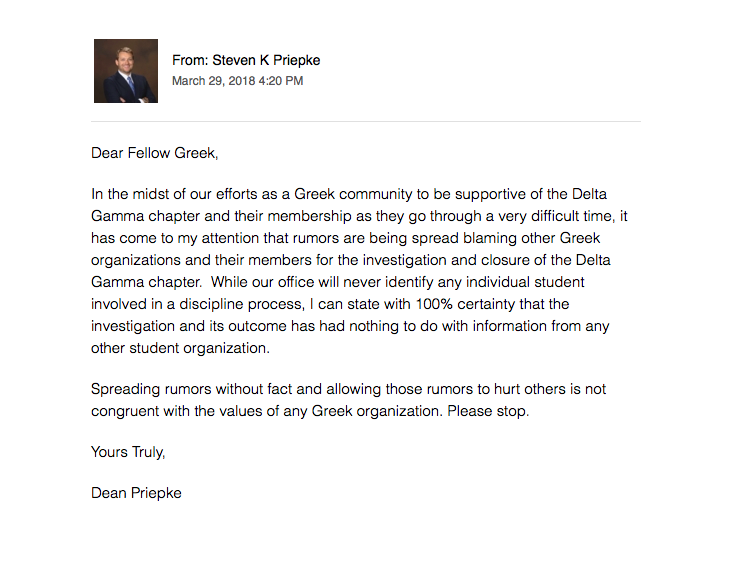 Senior Associate Dean of Students Steven Priepke sent an email to all members of Greek Life on March 29. In the email he addressed the suspension and rumors surrounding disciplinary action taken against the students involved in the hazing. Multiple sources, including self-identified alumni members of DG, have approached The Miami Hurricane with statements that a member of the organization leaked videos of alleged hazing to the administration. The message was seemingly in response to persistent allegations that another sorority sent the incriminating videos of DG to administration. “Spreading rumors without fact and allowing those rumors to hurt others is not congruent with the values of any Greek organization. Please stop,” the email read. The Miami Hurricane reached out multiple times to UM’s Delta Gamma chapter president Emily Gerstein, Panhellenic president Abby Washer and members of Delta Gamma, but they could not be reached for comment. More information on the cease and desist and allegations can be found here.